Then you could have an Apple product that you REALLY don't want to leave behind at a California beer hall. Stuart Hughes, a British company that bills itself as a purveyor of "ultimate luxury," is offering a 22-carat gold iPad encrusted with more than 25 carats of flawless diamonds (including a diamond Apple logo). The company has made 10 copies of their Gold iPad Supreme. "This most luxurious iPad's appearance is outstanding even down to the precise polishing to reveal its most beautiful harmonious appearance," the company's website says in a curiously worded sales pitch. 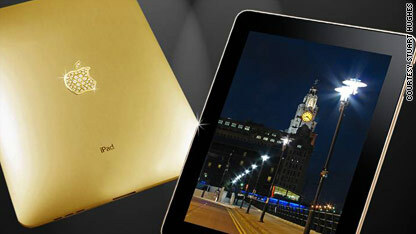 The tablet computer costs 129,995 British pounds - roughly $190,000, depending on the exchange rate at the moment. No word on whether that price include personal hand delivery by Steve Jobs. And, for the record, Stuart Hughes shelled out the extra $300 or so to get the top-of-the-line 3G, 64GB version. You know ... ultimate luxury and all. Obama can't work an iPod. Really? He's the tech president - the one who totes around a BlackBerry, and who gave the Queen of England an iPod as a gift. But in a commencement address at Hampton University in Virginia on Sunday, U.S. President Barack Obama said there's a darker side to the technologies that have helped build his image as a hip and digitally enabled public servant. "With iPods and iPads; and Xboxes and PlayStations - none of which I know how to work - information becomes a distraction, a diversion, a form of entertainment, rather than a tool of empowerment, rather than the means of emancipation," he said in the address, according to a transcript posted by KTKR. "So all of this is not only putting pressure on you; it's putting new pressure on our country and on our democracy." Education is the key to keeping these digital distractions in check, Obama said. "Class of 2010, this is a period of breathtaking change, like few others in our history," he said. "We can't stop these changes, but we can channel them, we can shape them, we can adapt to them. And education is what can allow us to do so. It can fortify you, as it did earlier generations, to meet the tests of your own time." Some tech bloggers sympathized with the concerns. "I worry that some of these students will have been tweeting his words from their cell phones as he spoke them," writes Chris Matyszczyk at CNET. Others find the comments curious, given Obama's history of promoting digital information. "Since Obama coordinated his entire campaign on his Blackberry (sic), his comments here border on hypocrisy," writes a commenter called "Camp David" on an AppleInsider forum. "I'm still clinging to my BlackBerry," he said, according to an online transcript. "They're going to pry it out of my hands." Given his apparent tech literacy, I wonder if Obama was kidding about not knowing how to work an iPod, iPad, Xbox or PlayStation. During the 2008 presidential campaign he told Rolling Stone his iPod contained songs by Bob Dylan, Jay-Z and cellist Yo-Yo Ma, among others. Presumably, his staffers didn't turn it on and work it for him. Or do these comments seem disingenuous? Can the president who gave the Queen an iPod really not know how to use one himself? Let us know in the comments (and try not to ruin democracy while you're at it). Will the iPad be bigger than the iPhone? That's true in a physical sense, obviously. Apple's iPhone fits in your pocket. 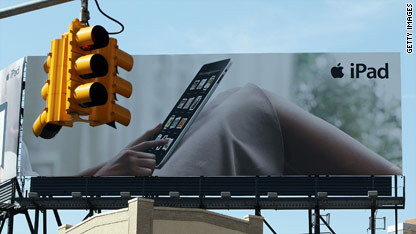 Its iPad - which is a touch-screen computer without a keyboard - would look ridiculous if you put it up to your ear. But the iPad, it turns out, is also bigger in terms of initial sales. 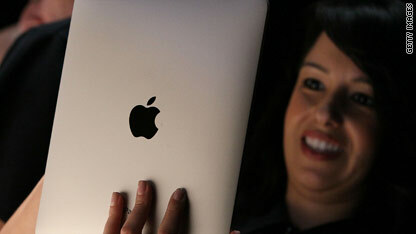 Apple on Monday announced it has sold 1 million iPad computers in the 28 days the device has been available. The iPhone, which debuted in 2007, didn't hit the million mark until 74 days after it went on sale. “Demand continues to exceed supply and we’re working hard to get this magical product into the hands of even more customers," Apple CEO Steve Jobs says in a press release. That begs the question: Will the iPad end up being a bigger hit than the iPhone, which has revolutionized the smartphone industry? It's very early, and the iPad still has a long way to go. While 1 million iPads have been sold this year, the analyst firm Piper Jaffray says 36 millions iPhones will be sold this year worldwide, according to the blog AppleInsider. It's also important to note that the iPhone cost $499 and $599 when it first hit the market. Sales didn't really take off until 2008, when Apple slashed the entry-level price of the device to $200, putting it within reach of more consumers. Let us know what you think in the comments. What, if anything, do these sales figures mean? Is the iPad on track to change popular computing the way the iPhone changed what a mobile phone could be? Apple CEO Steve Jobs on Thursday said 200,000 applications are available in his company's mobile app store - and they all benefit because they're not built in Flash. In a post on Apple's website, Jobs listed reasons none of those apps support Flash, a format that supports video, animation, games and other content and is made by tech competitor Adobe. Some tech bloggers have criticized Apple for not supporting Flash on its mobile devices, including the iPad, iPhone and iPod. But Jobs said Adobe Flash is a format for the past. Performance, not business strategy, guides Apple's decision not to use the format, he said. "Flash was created during the PC era – for PCs and mice," he wrote in the post. "Flash is a successful business for Adobe, and we can understand why they want to push it beyond PCs. But the mobile era is about low power devices, touch interfaces and open web standards – all areas where Flash falls short." Adobe has complained its business "could be harmed" by Apple's decision not to use the format. _ "iPhone, iPod and iPad users aren’t missing much video," he wrote. _Apple products run more reliably without Flash: "Flash is the number one reason Macs crash." _Flash isn't made for touch-screen devices: "... Many Flash websites rely on 'rollovers,' which pop up menus or other elements when the mouse arrow hovers over a specific spot." Apple's touch screens don't use rollovers. _And, most important, Jobs said, is that Flash slows down app development: " We cannot be at the mercy of a third party deciding if and when they will make our enhancements available to our developers." What do you think? Is Jobs right, or should Apple support Flash on its devices? The 3G version of the iPad, which connects to the Internet over AT&T's wireless network, will go on sale in the U.S. on April 30, Apple announced Tuesday. The suggested retail price is $629 for 16GB, $729 for 32GB and $829 for 64GB. The Wi-Fi + 3G model is priced higher than the Wi-Fi-only model released in the U.S. on April 3 because its 3G capability will allow users to surf the Web without a Wi-Fi connection. Customers who have not pre-ordered a 3G iPad will have to wait until 5 p.m. on April 30 to get their hands on the new model. “Apple retail stores will offer a free Personal Setup service to every customer who buys an iPad at the store,” according to the company's press release. All versions of the iPad will go on sale at the end of May in Australia, Canada, France, Germany, Italy, Japan, Spain, Switzerland and the UK, Apple said. Apple fans in Japan, the United Kingdom and seven other countries will have to wait longer to get their hands on iPads. Apple is postponing the international release of its new iPad because of stronger-than-expected demand for the device in the United States, the company said Wednesday. A statement posted on Apple’s Web site said Apple has delivered more than 500,000 iPads since they went on sale in the United States on April 3 and the company expects demand to stay high. “Faced with this surprisingly strong U.S. demand, we have made the difficult decision to postpone the international launch of iPad by one month, until the end of May,” the post said. The slate computer was originally scheduled to go on sale April 24 in Australia, Canada, France, Germany, Italy, Japan, Spain, Switzerland and the United Kingdom. Apple now will begin taking international pre-orders on May 10. “We know that many international customers waiting to buy an iPad will be disappointed by this news, but we hope they will be pleased to learn the reason - the iPad is a runaway success in the U.S. thus far,” Apple's post read. 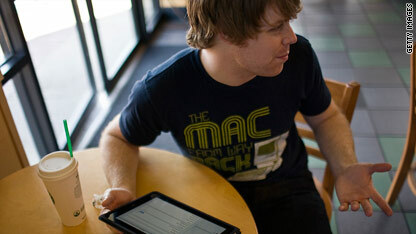 The iPad is a touch-screen, wireless computer that occupies the digital turf somewhere between a laptop and a smartphone. The model available now in the U.S. connects to the Internet over a Wi-Fi connection. Later this month Apple will start selling an iPad version that connects to the Web via 3G wireless service from AT&T. 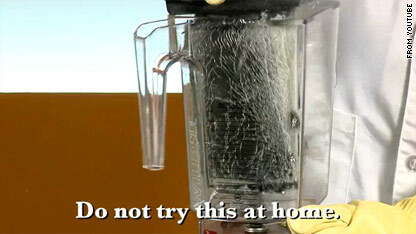 The Web's latest viral video hit comes from the popular online series called "Will it Blend?" The premise of the show is simple. A guy in glasses and a lab coat (who just so happens to be the founder of a blender company) puts stuff in a kitchen blender and then declares the objects blendable or not. Monday's iPad blender test has been watched 2.8 million times on YouTube. So does the iPad blend? Tom Dickson, the show's host and founder of Blendtec, says yes in the video, as he pours the ashy remains of an iPad onto the counter top. But with a caveat. Dickson has to bust the iPad into two pieces for the 9.7-inch screen to fit inside the appliance. A number of other iPad-destruction videos are getting passed around the Web, too. Some guys decided to bust their iPads within moments of purchasing them. Not everyone is happy about this trend. "Why is it that all these people on the internet want to destroy iPads? It makes me weep," he writes. Some environmentalists see the stunts as wasteful. "This joker and cohorts need to go tour some of the horrendous precious metal mines, the manufacturing facilities, an e-waste dump and get first hand experience with how much goes into creating and disassembling one of these devices so that they begin to grasp that this is not funny." In an apparent attempt to steal some buzz from Apple's brand-new iPad, Hewlett-Packard on Monday released some details about its "slate" computer, which will go on sale later this year. A new blog post and video highlight some apparent differences between the two gadgets: The HP device has two video cameras, a USB connection and also support for Flash animations. 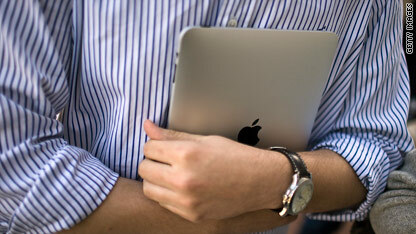 The lack of those features has been a consistent gripe among iPad reviewers. Think about the last time you chatted with friends over Skype on your notebook. Or uploaded a picture from your mobile phone to Facebook or Flickr. How about the last time you viewed images or video from an SD card or a USB device. We know that you expect to be able to capture and share digital content on your mobile devices. And the HP slate device excels there. 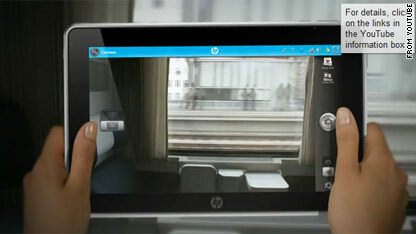 A short YouTube video posted by HP indicates the tablet-like device will have two video cameras - one for taking images of the environment, and one that captures the person holding the device. That second camera could be used in live video chats, for example. HP briefly showed off the device at the Consumer Electronics Show in January, and has since been leaking videos with new details about how it will work. There's no word yet on how much HP's device will cost, or exactly when it will be released. Apple CEO Steve Jobs stopped by the company's Palo Alto, California, store on Saturday as people lined up to buy Apple's new lust-device, the iPad. The Apple guru, wearing jeans and a black hoodie, sneaks out of the store unmolested in this video, shot by CNN affiliate KTVU. Jobs is said to live nearby. According to the San Jose Mercury News, Jobs sauntered into the store about noon and spent about a half-hour inside, chatting with shoppers who appeared stunned to see him. During his visit, Jobs gave a brief demo of the iPad to a young customer, according to this report. 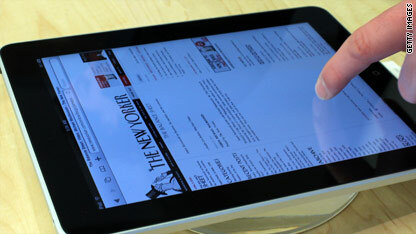 Jobs, who is a cult hero among Apple fans, has called the iPad "magical" and "revolutionary." For more on the iPad, check out our list of 12 commonly asked questions about the iPad, and this Wired story on choosing the iPad configuration that's right for you.